Hamby Home(in)stead ...: She's a shocker! Tea's had quite a week. We're used to chasing her away from various inappropriate taste-testing. One of her favourites is the compost heap. My freebie bins are not cow-proof and my compost-making has stalled as a result. Last week Erin rescued a length of irrigation pipe that Tea had partially ingested - the bovine equivalent of a sword-swallower busker! The horrible heifer has excelled herself this week. As well as the usual crop-cropping and more minor misdemeanours, she has achieved notoriety on a much larger scale. On Monday she breached the clip-lock bin and scoffed the last of the chook food. It was a grainy variety that the girls didn't much care for but Tea obviously liked it a lot cos she came back on Tuesday morning, keen for another go. I don't remember what she did on Wednesday. That may have the day that she ate Erin's bleeding heart tree (a gift from Museum Victoria). On Thursday, she spooked herself (and Erin) by stepping up and poking her head through the caravan door in an attempt to steal and sample Erin's thongs. We went out yesterday morning. As usual Erin latched her caravan door. When we returned the door was unlatched and it was clear that a 300kg cow had spent some time in the van, breaking a few items and leaving a trail of grass and foot-prints. Initially Erin couldn't find her prescription medication and there was concern the cow may have eaten it and the nearby scripts but both were later found intact. Thankfully. You can see this morning's effort. 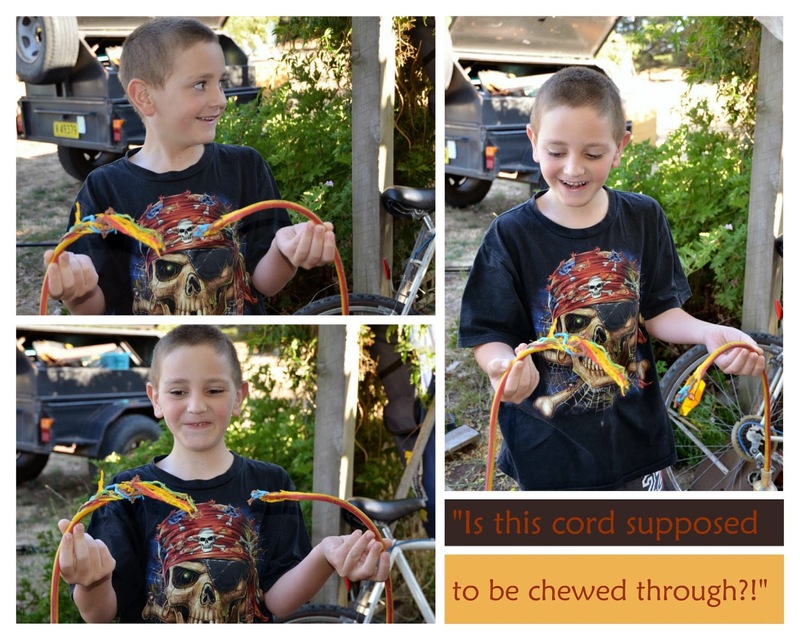 Vaughan went outside to ride his bike and asked whether the yellow and red cord was meant to be all chewed at the end. Er, no. It's not. And on closer inspection there are in fact two ends, resulting from the cord being chewed completely through. Lucky it wasn't plugged in. Nick's out in the big paddock now. Our electric fence energiser arrived on Monday. It needed an initial three days charging and is ready for testing. We have our fingers crossed that it will be a shocking (hah!) success!